Priya jerked back to present by raina. raina cuddled to priya. " can we both stay with u tonight" priya assured her "y not ur my family too' ur uncle will sure accept u" she engrossed in deep thoughts rina kissed priya n went inside. 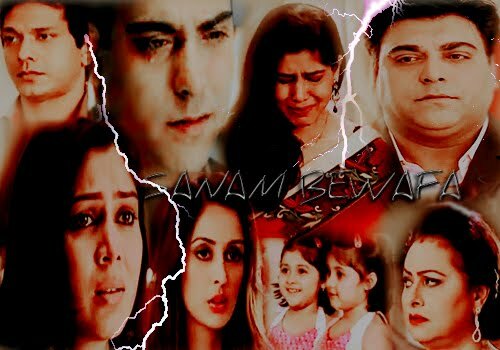 Priya thinks of the darkest person of her past' ram accepted my mom n my sister how wont he accept u two kids. U will be our daughters too. I know abt my ram!! A alone tear escaped from her eyes''. Sid is furious to destroy ram as well priya. He wants revenge and property. He took Ayesha as cue card. In the mean time Sid followed Ayesha, he trapped her by making her busy in modelling assignments. Soon they became good friends. The real cue of the friendship is revenge on raya. For a moment Ayesha thought she is magnetised to sid but all she want is property and power which is the monarchy of ram. Sid is attracted to Ayesha but just want to feast her beauty and use her as weapon on ram. Sid and Ayesha had a planning party . Ayesha lie to shipra that she is on amodeling assignment to delhi, she was totally drunk sid used this chance. Ayesha and sid spent a night together. Soon she woke up she saw sid infront of her in robe. She saw herself naked in the bed. He gave her robe and dissolvable disprin for her hand over. She realised what has happened. It not new to her sid is been waiting for her response on their affair. Sid being curious asked her if she know what happened to them the previous night . very casually Ayesha came n sat in sids lap pushed him to the bar counter ' am not a kid , Am drunk ,I know what happened.i let u do I do remember ur groans' sid is surprised,she confiremed this lady suit him in many ways for revenge and for favours. He complimented her that she is awesome. She concluded it's his reward for the help he has done to modelling assignments. They officially became partners in crime. Priya rented a sharing apartment, she is tired , scared to be alone .she wished ram by her side. Remembering what all happened in flight she slept thinking of ram. Ram in his hotel room was not able to sleep took her photo out his wallet, kissed it .. darling y r u running away from me. he called to kk , he was stated that next time he come to india its with her priya to be his wife. A week passed priya tried hard to adjust in the new environment. She is no more a lecturer she joined as an office. Its been one week of her appointment in new office she heard a very bad news ,some company take over this one n they work collaborated. Everyone is worried how many people jobs are left and how many will be fired. Her new friends here are nisha and tony. Tony is flirtatious always try flirting nisha and priya. It's a secret that nisha and tony are couple. Priya some how managed to be alone . she was happy hearing someone is coming to stay in her apartment from now. She went back home, prepared food to her. Changed herself to a loose t-shirt and Capri pants. Got bored reading a book . she took her dairy flipped the pages back. The only thing it is filled with is Ram, her partner in this loneliness. With his thoughts she never felt alone. She started writing her dairy. "I wish .. we can live together for ever ram 'I love u ur my life" she closed the dairy with this. she heard the bell ring. She opened the door and stood in shock.
" u '.. how.. why did u come here, how did u know this is my house?" " if u move aside I will move my things to my shared apartment"
" but''. Raam how come u come here and y r u here?" She moved aside, ram shifted his belongings to his room.. he dint answer to priya. she continued her pestering.
" kitchen'" she pointed the way.. he tried hard to make something to eat but just could make coffee..
"I think I ll go out and eat something." He turned to priya..
" am going out .. doo let me know if u want something"
" yes.. answer!!! FROM U '"
He pulled her close to him "did u care to tell me y were u here , did u care to tell me the reason to suppress ur feeling on me? y were u ignoring me? how could u expect I answer u darling" he smiled was about to gout .
" raam.. [she called softly]' don't eat out come will share the food. We r roommates.. I will make roti's in turn one delicious cup of coffee .." he smiled.. both went to kitchen priya made roti's for them as ram helped. No more questions ..everything postponed as rams room is messy he slept in hall and priya in her room peacefully as her ram is with her. Priya came live with sound of the door bell ' she moved towards the door expecting ram. Her two angels rushed and opened the door..
"papa''" two shouted at once'while they opened the door..
Priya moved kids aside and invited ram inside ..